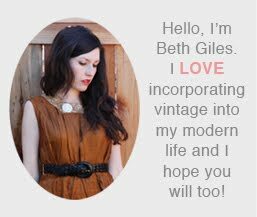 Vintage Clothing Blog | Vintage Wedding Dresses | Salvage Life: Vintage Style Post - Let's Play Dress Up! Vintage Style Post - Let's Play Dress Up! One of the things Amy and I always loved to do growing up was play dress up! My parents still have tubs and tubs of dress up and costumes from our childhood. Sometimes I'll even comment on a purse or scarf Amy is wearing and she'll say "I found it in the dress up!" Ha ha! Since this is such a favorite past time, I've decided it's something we need to incorporate into our work routine. It only makes sense that we would try on the clothes we sell, right? Then, if we snap a few photos, we can give you ideas on how to wear some of the things in our shop. Here is an outfit that Amy and I styled for her using mostly pieces from Salvage Life. We are carrying a few "new" (non-vintage) items in our online shop, just to give it a try and this skirt is one of the them. I love how this outfit is sweet and a little bohemian. It's perfect for early fall with pale earthy colors and light layering. And the yellow nail polish? So fun!